Q: Why was RRRP created? A: There are over 40,000 veteran specific resources in America today. The VA and DoD are overly complicated bureaucracies and can be incredibly frustrating to navigate. When facing a crisis, finding the right professionals and resources shouldn’t be the hardest part. We want to provide support and empower you to succeed. A: IAVA’s Rapid Response Referral Program (RRRP) is a referral service with an intensive remote case management component. 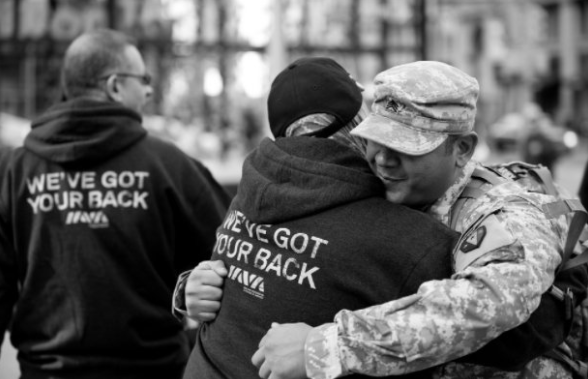 Our high-tech, high-touch, strength based model of case management provides support and helps connect veterans with the benefits they’ve earned and the resources they need to meet their goals. We work with our clients remotely via e-mail and phone. Q: Who are our case managers? A: Our case managers, or Veteran Transition Managers (VTMs) as we call them, are masters-level social service professionals with a high degree of Military Cultural Competency, who specialize in veteran benefits and programs and can help guide our clients in all aspects of transitioning and life after service. Q: What is case management? A: Our VTMs utilize the strength based perspective in their approach, are trained to carefully consider your needs and look at your care plan holistically, understand the issues you’re facing and know the resources to help deal with them. Our VTMs support and provide encouragement, follow up with clients and referral partners, advocate on your behalf and connect you with any relevant resources you may need. However, our VTMs do not engage in clinical counseling or therapy. While we are here to assist you, the VTM will not do all of the work for you. We want to equip you with the right tools, provide support, and empower you to succeed. It is up to you to follow through. Q: I am tired of getting the runaround. I don’t want a referral, how can you actually help? A: By working with us, you are getting access to a dedicated Master level case manager who will work with you on resolving whatever issue you may be dealing with and connecting you with relevant services in your area. Before making any referral, we verify your eligibility and do our best to make sure they can assist. It is up to you to follow through. Q: What will you do with all the information I provide at intake? A: Our intake process is designed to provide us with only the most relevant information we need in order to better assist you, make referrals and to best understand your needs. All of your responses are confidential unless there is an indication that you are a risk to yourself or someone else. Q: How long does it take for me to begin working with my Veteran Transition Manager (VTM)? A: We respond to every inquiry within one business day to initiate the intake process. After your intake is completed, your VTM will reach out within five business days to begin working with you. If you are reaching out at the end of the work week, you will not hear back until the following business day. Q: Does RRRP only assist Iraq and Afghanistan era veterans? A: No. We work with any and all U.S. veterans from any era, including peacetime veterans. Q: Do you assist veterans with Dishonorable discharges? A: Yes. We will work with any veteran no matter the discharge status. Q: Can I reach out for assistance more than one time? A: Yes. If you’ve worked with us in the past and require further assistance, feel free to reach back out. Q: I am a family member/friend reaching out on behalf of a veteran. Can you still help? A: Yes. We work with both veterans and their family members. And we define family the way the veteran defines it. Q: Which states do you assist veterans in? What if I am a U.S. veteran who lives abroad. Can you help? A: If you are able to reach us via phone or email, we will work with any U.S. veteran anywhere in the world. Q: How long will you work with me? A: We will work with you until you’ve gotten linked up with the support and assistance that you need, your issue has been resolved or we’ve exhausted all resources and avenues. Q: Am I guaranteed to get the assistance I reached out for? A: We will do our absolute best to help, and exhaust all possible options, but we cannot guarantee a successful resolution for every request. Q: Can I walk into the IAVA offices and request to meet with a case manager? A: No, but you can call or email anytime. Any office visits should be made via an appointment with your VTM. Q: Will RRRP provide me with emergency financial assistance? A: No. RRRP is not set up to provide cash grants. We are a referral based program. We will help you determine eligibility and connect you with organizations set up to provide emergency financial assistance. Q: I just need financial help, why is my VTM telling me to connect with financial coaches and asking me about my education, employment, mental health and other things? A: Typically financial hardships are an outcome of other underlying challenges and getting to the root cause of the issue is the best way to move forward. We work closely with Consumer Financial Protection Bureau (CFPB) and their Financial Coaching Initiatives to help our clients repair their credit, help understand their finances, and create budget plans. We also want to make sure you have all the necessary support going forward as it relates to anything else which may exacerbate your financial hardship. Furthermore, many organizations providing direct financial assistance, even when you qualify, look for sustainability plans before releasing their funds to you. All of the above steps factor into that. Q: Who do these financial assistance organizations help and with what exactly? A: Each financial assistance program has their own eligibility criteria. Factors such as reason for financial need, current income, number of dependents, service era and disability ratings are among some of the qualifying criteria. Depending on the program and their available funds, they may assist with emergencies related to back rent, utilities, vehicle repairs, funds for food and other needs. Q: Can you help me move? I need help finding an apartment. A: RRRP does not act as a realtor to locate housing, but can connect veterans and their families to these individuals or companies through VA funded programs or Community Based Service Organizations. Q: I am homeless or in danger of losing housing. What can RRRP do here? A: Loss of housing is typically a very multifaceted issue. Often these situations involve unemployment/under-employment, financial hardship, lack of mental health resources, or death in the family to name a few. We will assess your situation and make the appropriate referrals which best suit your needs. Our goal here is to find a short term solution, but also to carve out a path back to self-sustainability. Q: Can you help me with with home repairs? A: It depends. If you are renting, it is up to your landlord to keep your residence structurally and environmentally safe for habitation. If your landlord is unwilling to make the necessary repairs, we will look at any and all options available to you. If you own your home, there may be options either through the VA or other non-profit organizations depending on your individual situation and need. Q: Will someone from RRRP be able to represent me in court? A: No, but we will work hard to help you find representation. Q: Can I be provided with a private lawyer specializing in family or criminal law free of charge? A: It is very difficult to secure pro bono legal assistance in regards to criminal and family law. Depending on your individual circumstances you may qualify for assistance via your local legal clinic or the American Bar Association. Q: I need legal assistance with my discharge upgrade or other VA benefits related issues. Can you help me find an advocate? A: Yes. There are state and local programs around the country providing free legal assistance to help prepare discharge upgrade packets and help with benefits appeals processes. Q: I need a free lawyer for housing/small claims court. Can you help me find one? A: We will take a look at what is available in your area. Availability varies from city to city and state to state. Q: Will you file my VA Disability claim for me? A: No. RRRP cannot submit VA claims/appeals directly on the behalf of our clients. However, we will walk you through the process. If you need assistance on the ground we will refer you to a local resource where you can be assisted with filing your claim. Q: Can you help with VA issues? A: Yes. We can contact the VA and advocate on your behalf. We’ve had a lot of success and we will do our best to help, but cannot guarantee a successful resolution to every issue. Q: Can you help me access public benefits? A: Yes. However, RRRP does not file SSDI claims or appeals, unemployment claims, SNAP applications or any other public benefit applications. We will gauge your eligibility, provide guidance and connect you with local resources which can help you gather the necessary documentation and file your claim. Q: I heard that there are going to be changes to the GI Bill beginning on July 12, 2019. Can you explain these changes? A: Effective July 12, 2019, eligibility to transfer education benefits to a dependent will be limited to service members with less than 16 years of total active-duty or selected reserve service. Previously, there were no restrictions on when a service member could transfer educational benefits to their family members. The provision that requires a service member to have at least six years of service to apply to transfer benefits remains unchanged in the policy. All approvals for transferability of Post-9/11 GI Bill continue to require an additional four-year service commitment in the armed forced. To find out more, click here or contact RRRP today. Q: I need help with a GI Bill related issue or I just need someone to help me makes sense of it. Can you help? A: Absolutely! We can walk you through the process and tell you exactly how to get the most out of the education benefits you’ve already earned. If you are experiencing issues with your GI Bill, we will advocate on your behalf with the VA Education Department, help you troubleshoot your benefit and let you know what needs to be filed and where in order to successfully navigate the VA bureaucracy and resolve your case. Q: Will a RRRP representative be able to advocate on my behalf with Voc Rehab counselors? A: Yes, once we have your VA release of information (VA Form 21-0845) form authorizing us to do so. Q: I’m not sure how the #ForeverGIBill affects me. Can you help? A: Yes. Contact us and we’ll help you figure it out. Q: I transferred/want to transfer my education benefits to a family member and the VA says I can’t. What do I do? A: The rules governing GI Bill transferability are very rigid. We will do our best to help you understand the nuances of the law, how this decision was made and speak about options. Q: My VA service connected disability is being recouped. Can you help? A: Yes. Whether it is due to an overpayment, separation pay, your education benefits or an error, we can help you challenge the VA decision and put together the necessary paperwork to request for a Waiver, Compromise or Payment Plan. We will do whatever we can to help, but we cannot guarantee successful resolution. Q: Can I receive therapy through RRRP? Can my case manager be my therapist? A: No. RRRP social workers do not engage in clinical counseling or therapy. RRRP connects Veterans and their families to various VA mental health resources, state and county resources, as well as community based mental health clinics and programs. Q: I am looking for alternative models of mental health treatment, but know very little about it. Can you help me? A: Yes. We can explore with you different types of non-traditional models (Equine therapy, Yoga, etc) and see what is available in your area. Q: Can you help me get a service or an emotional support animal? A: Yes. We can walk you through the process and connect you with best in-class service animal programs locally or nationally. Q: Is there assistance for family members or friends of Veterans who have experienced tragedy as a result of Veteran Suicide? A: Yes. There is support out there and we are standing by to make the connection. Q: I am a family member of a Veteran and I am looking for mental health resources for them. Can you help me? A: Yes. We will work with you to get a better grasp on what’s available and how to go about getting your veteran connected with the support that they need. Q: Will you get me a job interview or help me get my foot in the door? A: No. We will asses your efforts thus far, provide guidance and support, help you expand your job search and empower you to put your best foot forward as you apply. We also have some great partners which do have the connections with employers and will help you identify employment opportunities, review resumes, conduct interview and salary negotiations prep, as well as other vocational services. If you or a veteran you know needs help, reach out to RRRP today!